For skaters who are very new to skateboarding or would like more dedicated support, PSG offers One on One Skateboard lessons to take place at area public skateparks on Saturday mornings. Lessons are priced per 1 hour session and can be booked up to 5 sessions at a time. Most sessions will be Saturday mornings but other times may be scheduled as needed. 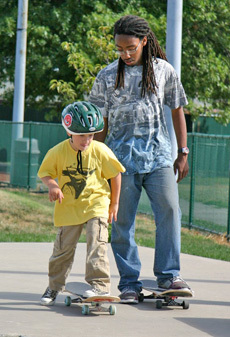 One on One Lessons can be scheduled at area public skateparks depending on where you live and what you want to learn. Choose from any of these skateparks for your One on One Lessons. Lakewood: Lakewood Skatepark on Lake Ave.
Cleveland: Crooked River Skate Park in Rivergate Park off Columbus Rd. Bay Village: Bay Village Skatepark on Cahoon Rd. near Wolf Rd. Contact mike@publicsquaregroup.org or vince@publicsquaregroup.org to make arrangements.